Who doesn't love Little Golden Books? I grew up reading them and I have read them to all of my children! I think that Little Golden Books are a CLASSIC that never gets old! Thanks to Gymboree, Golden Books make the perfect baby shower gift too! I love stories with kitties…I am just a sucker for kittens! This line has a pink theme to it so is perfect for sweet baby girls! 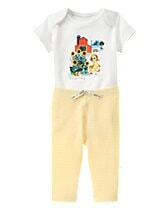 There is this adorable onsie and pants. 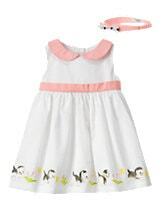 There is also a this really cute dress for spring! The Pokey Little Puppy is a great story and the collections for little boys are just perfect! I love the jumper for spring…great for Easter pictures! The sweet story of The Fuzzy Duckling brings us to the last book in Gymboree's new Little Golden Books collection. The best part is that The Fuzzy Duckling sleeper is yellow and so can easily be gender neutral for people who may be waiting to find out what they are having! Yellow is one of my favorite colors and I love these cute ducks! Gymboree has these three books available in the store and online so that you can include them in your baby shower gift! As a new mom…I loved getting Gymboree outfits at my baby showers! The clothing is such good quality…always have matching socks, hairbows, etc. and are great for resale! Which of these books is your favorite? Are there any Little Golden Books you would like for Gymboree to include in this line? Right now this line is a limited edition…so get them before they are gone! As part of the Little Golden Books baby collection launch, Gymboree is hosting a One Big Happy Storytime sweepstakes, giving away everything a family needs to make storytime extra special. Your readers can enter for the chance to win over $2,000 in prizes, including Little Golden Books nursery bedding and décor from The Land of Nod, a set of Little Golden Books from Random House, and a $500 gift card from Gymboree. Fans can see rules and enter at gymboree.com/littlegoldenbooks now through February 29; winners will be announced in March.